Monday August 29, 2016 is when the new Small UAS Rule, Part 107, comes into effect in the USA. New testing and a “Remote Pilot Certificate” will be available for the first time in history; enabling the Regular Use of UAS during daylight hours, within visual line of site. This is a big deal, if you didn’t already know that. It offers commercial users the first clear-cut path to proper use of UAS in business operations. It clears numerous hurdles for the insure-ability of drone use. This is huge for the UAS industry! Remote Pilot – Small Unmanned Aircraft Systems Airman Certification Standards can be viewed here. www.faasafety.gov offers free courses that teach about Part 107, among other airman knowledge tests. There are also courses listed there from schools that are fee based. Capetown, South Africa is where Airborne Drones builds the new Vanguard Inspection drone, which boasts a 94 minute flight time. This model is aimed at utility inspection, border patrol and other surveillance missions where distance and length of service is critical to the mission. Palm Beach Drone is proud to be working with Airborne Drones to fulfill missions where a VTOL aircraft is required, but where 30-40 minutes of flight time just won’t work. Call us today to secure a quote on this phenomenal machine, or any of the other commercial Aircraft they offer, at 561-389-1490. Inspection drones are just a start though. Airborne also makes Package Delivery drones and Lidar Equipped 3D Mapping systems that are Turn-Key. Airborne Drones has been making headlines with their long endurance aircraft since 2014, and with prices starting at $4,999 it is easy to predict the success of this firm going forward. Call today 561-389-1490. Airborne Drones Thermal 3 from Airborne Drones on Vimeo. BOULDER, COLO, July 21, 2016 – Agribotix, an industry leader in drone-enabled agricultural intelligence, announced it is now integrated with the John Deere Operations Center. Results from the award-winning Agribotix FarmLens platform provide farmers comprehensive, actionable data to increase yields and reduce cost. These include best-in-class drone data processing, analytics, NDVI Field Health Maps, and Variable Application Reports which can now be sent directly to a user’s John Deere Operations Center account. The integration allows a user to push the Agribotix Digital Scouting Report directly into their Operations Center account. 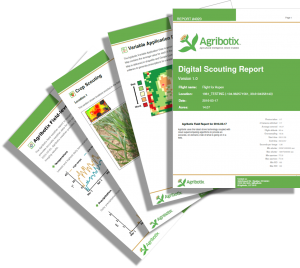 This report, the most intuitive and effective in the drone analytics market, combines whole-field evaluations with field-specific weather data and location-tagged photos and comments from scouts or agronomists. “Because Agribotix is the leading drone solution provider dedicated solely to agriculture, we are especially excited about providing our customers a direct connection to John Deere, a company that shares our mission to help farmers stay competitive,” said Agribotix COO Paul Hoff. Agrion Drone System: a major game-changer; affordable, portable, and built on the DJITM PhantomTM. Beginners fly within minutes, and produce real-time decision support for any farming operation. Bundled with three months of FarmLens service. Enduro Quadcopter: covers 160 acres in half an hour; cost-efficient and easy-to-use; multiple sensors allow more informed decisions about input, irrigation, pest control and weeds. Comes with one year of FarmLens service. FarmLens data processing and reports: fast, high-quality analytics bundled with all Agribotix drones and also available for people who already have their own. Provides results that help identify disease and pests, highlight issues with irrigation, plan precision applications, and better manage farmland. FarmLens report set includes Field Health, Variable Application, and Digital Scouting reports. As global agriculture conditions press farmers to revolutionize the way they grow food, drone-derived data can help. Used in 45 countries on more than 44 crops, Agribotix is the chosen strategic partner to process drone data for farmers and advisors looking to gain an edge. Agribotix can be reached at Agribotix.com, info@agribotix.com or +1 (720) 295-3625. DJI and PHANTOM are trademarks of DJI. Agribotix, Agrion and FarmLens are trademarks of Agribotix, LLC. The Airborne Law Enforcement Association held their Annual Conference and Trade Show July 18-23 in Savanna Georgia. There were over 160 Vendors displaying Helicopters, Planes, Communication Systems, Sensors and Drone Technology that are designed for Law Enforcement and First Responder use. The Aeryon Skyranger, a favorite in Law Enforcement circles, was on display. The Skyranger is weather resistant and handles well in strong winds and inclement weather. Aeryon offers the Skyranger with Optical Zoom, Thermal and EO-IR payloads, as well as configurations for Inspection and mapping applications. Sensor Vendors like ADI-ISR, Flir, LRAD and others displayed the latest in EO-IR, Thermal and Accoustic sensors, many for use on Small UAS systems. We were very impressed by the Frazier Optics “Stedi-Eye Airborne” sensor that was on display for use on any small UAS. This brand new device, weighing in at 300 grams, will allow a wide range of uses on standard or custom UAS, allowing them to now compete with more proprietary systems that have integrated EO-IR sensor payloads. We would expect the cost to be around $30K for this game changer. Another really cool gadget from IMT was the “DropCam HD” which sported it’s own HD camera, Video DL and DVR in a rugged-ized component. The DropCam offers a number of interchangeable camera modules allowing for covert use, broadcast or data acquisition. Click here for the Spec Sheet on the DropCam. Our thanks to the staff at ALEA for a great event, and to Mr Don Bachali, author of the book entitled “The History of the Airborne Law Enforcement Association” ,for the book and vast amount of knowledge he was willing to share. Visit www.alea.org to find out more about the organization. They offer a lot of Resources to Law Enforcement Agencies on their website. One of particular value is the UAS Resource Guide. AT&T and Intel have agreed to test how Unmanned Aerial Vehicles (UAVs), more commonly referred to as drones, work on a network designed to connect devices on the ground. Intel and AT&T will be working to solve major issues in the space, including connectivity. Features like a live view of cameras and sensors on the drone or operating it beyond line of sight require a reliable nationwide network for connectivity. The AT&T Internet of Things (IoT) team and the AT&T Foundry innovation center in Palo Alto, Calif., will be working with Intel to evaluate performance of the LTE network at higher altitudes. They will be testing to see how it affects video streaming, transmitting telematics and flight information. At Mobile World Congress, Intel demonstrated the Yuneec Typhoon H with Intel RealSense™ Technology UAV, which streamed video and telematics from the air over LTE and used the AT&T core network. AT&T is also experimenting with using tethered drones to deploy Cellular On Wings (COW) service at remote locations, or boost service at large events, etc. They also use drones to inspect Cell Tower infrastructure, which speeds along repairs after a storm or failure. SAN JOSE, Calif., July 12, 2016 /PRNewswire/ — A new Chinese unmanned helicopter might be the industry’s first critical step to a functional aerial logistic platform in the near future. This unmanned helicopter, produced by Ziyan UAV (ziyanuav.com), excelled its counterparts by its outstanding performance in load-bearing, safety and speed. That’s where Ziyan unmanned helicopter kicks in. When people talk about “unmanned aircraft” on the market now, most likely they are referring to consumer quadcopters with multiple propellers on their arms to hover, rotate or fly. Due to the comparatively low technical barriers and open source model, there are numerous quadcopter products on the market. The induced drag in the wingtip of a wing, a propeller or a rotor is where the largest resistance appears, and also is what consumes the most power. That’s why a quadcopter with numerous propellers not only lacks the aerodynamic lift brought by the wings, body or rotor disc in a fixed wing aircraft, but also has pretty low efficiency because of the large number of propellers (and wingtips) and its limited size. These limitations have led to the poor performance of the quadcopters — low flying speed, short flying time and being not able to upsize or bear large loads. Moreover, the traditional fixed wing aircraft does not possess the VTOL (vertical take-off and landing) ability and thus requires a take-off runway or an open space for taking off and landing. However, the unmanned helicopters’ requirement for taking off or landing is much easier to fulfill due to its VTOL ability. It is also why unmanned helicopters can be applied to a wide range of use. Compared with the gas-powered medium-size unmanned cargo helicopters, Ziyan’s small-sized logistic platform (with a net load less than 15 Kg) is powered by batteries that largely reduce the risk while flying. Moreover, with the technologies in design and manufacturing, Ziyan is able to turn these aircraft into robotics, which can get tasks done for pilots, increasing the marginal cost of safety as well as the added value of their products. For users, it also helps to save time and cost. In April 2016, Ziyan ZYG 800 has entered the commercial market. More Ziyan products will be coming out this November on the 11th China International Aviation & Aerospace Exhibition. For Wang and his Ziyan team, this is merely the start. He expects to see the application of the Ziyan platform worldwide and to bring the “aerial logistics system” as Jeff Bazos noted from science fiction to reality. The Gaetz Aerospace Institute is a program aimed at High Schools to promote aerospace careers. By allowing concurrent admission to ERAU when enrolled in this program, the student earns FREE college credit. Embry-Riddle offers Bachelor and Master degrees in Unmanned Systems Management as well as the first Unmanned Systems Engineering Degree in the U.S. Visit www.erau.edu/index.html for more information on an aeronautic degree. Issues associated with UAS Airspace Integration. It also covers future and current trends affecting the UAS Industry. Click here to find out more about the UAS Workshop. The FAA Notice of Proposed Rule Making (NPRM) was published on February 15, 2015. This was the instruction on how to comment on the establishment of the regulatory framework needed to handle integrating small UAS’s into the American controlled air space. The FAA released the Part 107 Regulations on June 21, 2016. These are the guidelines that were expected to loosen up the restrictions on the Commercial Use of Drones. Visit http://www.faa.gov/uas/ to learn more about FAA Guidance on UAS. For the last several years, one needed a private pilot license, health certificate, insurance and a special exemption called a 333 Exemption in order to fly a drone for hire. Now, the FAA has released a simpler license called a remote pilot airman certificate with a small UAS rating to operate small Unmanned systems without the need for a full pilot certification. This new Certificate will allow for limited commercial uses, within the operators’ line of site, during daytime hours. Knowledge of Airspace Classification and use is requisite to flying UAS just as it is for flying a manned aircraft. Check out chapter 14 of the Pilot handbook here to get an idea of what that involves. The part 61 Certification process, which is a component of becoming a pilot for manned aircraft, does meet the new requirements for aeronautical knowledge. This course costs between $1,500 – $3,000 to complete at a flight training academy. There will likely be adapted versions of that certification test, that are only relevant to drone operators, which will evolve and which should cost much less to take. The FAA has indicated that their registration process should be up and running in August, so testing won’t start in most facilities until then. Aldebaran Robotics was originally established in 2005 by Bruno Maisonnier in Paris. In the summer of 2010, the robot “Nao” (pronounced Now) made global headlines by performing a synchronized dance routine at the Shanghai Expo in China. Since then, with over 5000 Nao robots sold in over 70 countries, this 2 foot tall robot quickly became a standard teaching instrument in robotic labs and university research programs over the last decade. In May 2011, Aldebaran announced that it would release Nao’s controlling source code to the public, as open source software. That same year they released the Nao Next Gen, featuring hardware and software enhancements such as high density cameras, improved robustness, anti-collision systems and a faster walking speed. In 2013, Aldebaran was acquired by Japan’s SoftBank Mobile for US$100 million. While research continued on Nao, another version, nearly 4 feet tall, was being developed named Pepper, who was first released in 2014. Pepper uses a touchscreen on it’s chest to access it’s App’s, and as a reading or browsing interface. Pepper was developed to read peoples emotions and to respond to them in ways that are soothing, or socially acceptable. Some would say it is an early version of a humanoid robot, that responds to our emotions and needs, using Artificial Intelligence (AI). In early trials, Pepper was well received as a store greeter, therapy robot and as an information kiosk for banks and retailers in Japan. The first 2 manufacturing lots of 1000 units were sold in Japan and were sold out in seconds, as universities and developers sought to snap one up . Data Plans for Pepper, to access the trove of AI it needs to function, cost a couple of hundred dollars a month. Current pricing models in Japan, which is still the only country it is available in, cost around $30,000 for the robot and $250 a month for the data access plan. Softbank Robotics has been carefully rolling out it’s worldwide distribution of Pepper as a robot targeted to consumer & business users by going on a world tour, as well as engaging beta testers and industry partners first. Later this month, June 20, 2016 a t the Future Stores Conference in Seattle Washington Pepper plans to teach retail executives how to drive in-store engagement with new clients. Next, Pepper will be present at the AT&T Shape Technology Expo in San Francisco on July 15-16, 2016 to dazzle even more robot enthusiasts. There is a Partner program developing in Europe already. Qualified applicants must purchase the robot, take a 5 day training program on robotics in Paris and agree to all terms for marketing and distribution. That qualifies you to become a reseller/ integrator / developer for Softbank Robotics. Click here to read the article on Mashable.com about the SoftBank Cell phone stores in japan that used Pepper as the primary sales force for several days, and people as the muscle to complete the delivery of goods, to test using pepper on an enterprise level. At first, it seemed that drones would allow anyone to look in on your back yard, without your permission. Florida was 1st in the Nation to enact Drone Regulations to address this erosion of privacy that Civilian Drones were causing. F.S. 934.50 regulates the use of drones in Searches and Seizure, (e.g. Law Enforcement Use), and was enacted in 2013. Senate Bill 766 evolved in 2015, which amended Chapter 934.50 to now include any person, agency or political subdivision form conducting unwarranted surveillance on any person, tenant, guest, etc. who enjoyed a reasonable expectation of privacy. The senate also included provisions giving the plaintiff in any civil proceeding the right to recover damages. A consortium of Small UAS Manufacturers, Government and Industry partners have forged a set of guidelines that are suggested for “Best Practices” which can be viewed by Clicking Here. It basically suggests that in order to preserve our privilege to fly in the airspace, people should self govern, and respect the privacy of others. It suggests, among other “Social Mores“, that you should have a persons permission to record them from an aerial perspective. Trust Palm Beach Drone to help you navigate your use of drones for any commercial venture or project. We offer the experience and connections to get the project moving swiftly, and on a strong legal footing. Call us today at 561-389-1490 to get started.